MARILYN DARTT REINHARDT, 78, of Lapeer, passed away February 27, 2013, at Lapeer County Medical Care Facility, surrounded by her family after a lengthy illness. She was born November 15, 1934, near Red Wing, MN, to (the late) Bertha G. (Featherstone) Dartt and Dr. Clifford F. Dartt. She graduated from Red Wing High School, received a B.S. Degree from North East Missouri State University and attended Kirksville College of Osteopathic Medicine. Marilyn married Jules Lawrence Reinhardt on July 3, 1954 in Red Wing, MN. Together, they have lived in Lapeer since 1963. She was a co-founder of the Health Enrichment Center School of Massage Therapy in Lapeer Michigan. A 50-year member of P.E.O., she was the founder of Lapeer P.E.O. Chapter DX. Marilyn was also very passionate about all animals. No stray ever crossed her path, animal or human alike, that did not find a loving home. 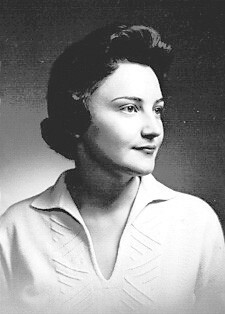 She is survived by her husband of 58 years, Dr. Jules L. Reinhardt of Lapeer; their five children, Jeri Lyn Reinhardt (Keith Lee) of St. Paul, MN, Erik Jay Reinhardt (Julie) of Lapeer, Jenifer Amrita Reinhardt (Aurelio Stella) of Rochester Hills, Jules Paul Reinhardt (Kathy) of Lapeer, Stefanie Dartt Reinhardt (David Villanueva) of Crested Butte, CO; seven grandchildren, Britton Nathaniel Reinhardt, Marilyn Olivia Reinhardt, Makaela Mae Reinhardt, Jules Ann Reinhardt, Sydney Dartt Reinhardt, Isabel Flora Stella and Nicholas Alexander Stella. Memorial donations to P.E.O. Chapter DX or the ASPCA are greatly appreciated. A memorial service was held Monday, March 4, 2013 at First Presbyterian Church in Lapeer. Pastor Todd Smith officiated. There will also be a celebration of her life to be held in Red Wing, MN later this summer. [S2413] Marilyn Dartt Reinhardt, The County Press Online - mihomepaper.com, http://thecountypress.mihomepaper.com/news/2013-03-06/Obituaries/Marilyn_Dartt_Reinhardt.html, 06 mar 2013, n/a. Hereinafter cited as The County Press. Dr. Jules L. “Jerry” Reinhardt, age 83, of Lapeer died at home Saturday, July 23rd, 2016 after suspending treatment of a long term illness. Jules was born December 31, 1932 in Red Wing, Minnesota to Helen (Werner) Reinhardt and Jules P. Reinhardt. Jules spent his youth on a farm situated on the banks of the Mississippi River in Hager City, Wisconsin. Jules graduated from Red Wing High School in 1952. He received a B.S. Degree from N.E. Missouri State University and Graduated from Kirksville College of Osteopathic Medicine in 1959. Jules married his high school sweetheart, Marilyn Greystock Dartt in 1954. They attended medical school together. After medical school Jules practiced medicine in Red Wing with Dr. Clifford F. Dartt. In 1963 Jules and Marilyn moved to Lapeer where Jules continued to practice medicine for over half a century. Jules was the Medical Director of the Lapeer County Medical Care Facility and a Clinical Professor of Medicine for Michigan State University for over 45 years. He was the longest serving doctor with Lapeer Regional Hospital, having also acted as Chief of Staff. Jules was dedicated to his patients and the practice of medicine. Over the years, “Doc” provided free medical care to thousands. He never cared about money. He was dual board certified in family practice and sports medicine. He was attending physician for many amateur and professional athletic teams and events including the U.S. Olympic Boxing Team. Jules himself was a very talented athlete. He was a Golden Gloves boxer and All State football player. He attended Minnesota State University – Mankato, on a full athletic scholarship where he also competed on the gymnastics team. When not at work, Jules was a true cowboy at heart who loved spending as much time as possible with his beloved horses. He was a member of the Lapeer County Mounted Posse for over 50 years. He also enjoyed shooting, skiing, hunting, fishing, camping, farming and raising livestock. If not for the scholarship, he had planned for a career as a forest ranger. The outdoors was his true home.